We’re abandoning the turkey this Christmas and cooking pork. My family likes a traditional Christmas dinner and much as we have mastered the best way to cook turkey, it can still be disappointing. 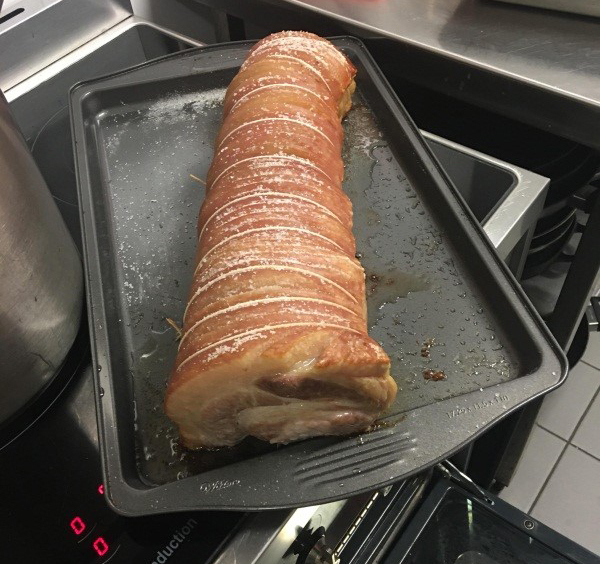 A boned, rolled, loin of pork will never disappoint with its protective fat and fabulous crackling. However, there are a few important steps to follow if you want to ensure your pork will crackle. 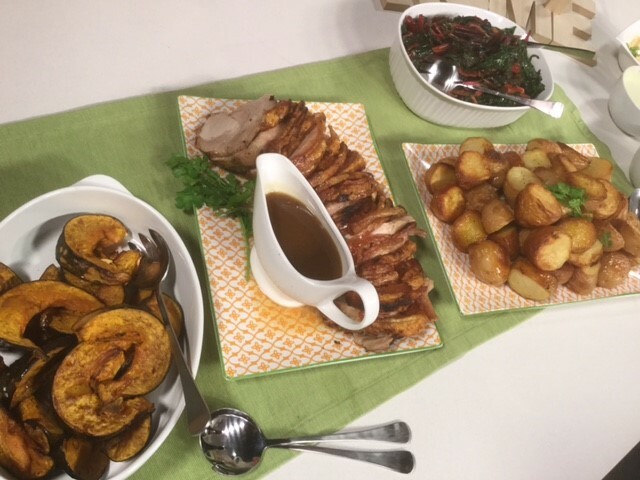 I had a trial run and doubled this recipe as the photos you see fed 16 very happy people in our studio. 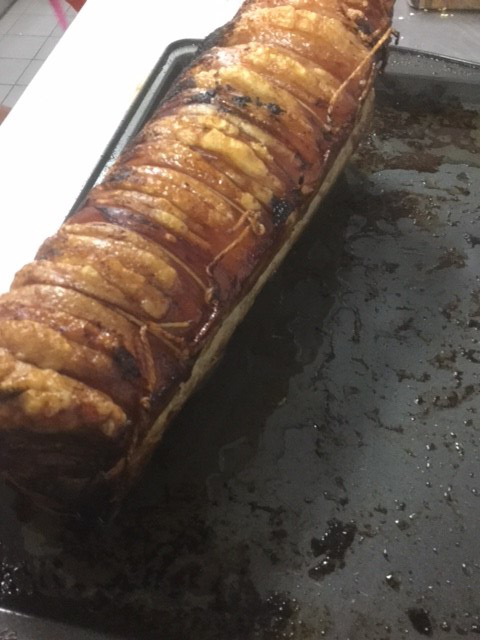 The key to good pork crackling is a good layer of fat under dry skin, so ideally begin this recipe the day before. 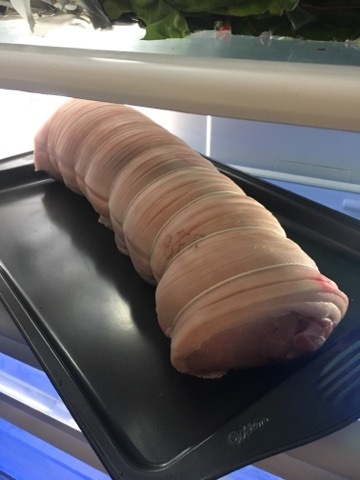 Score the skin (or ask your butcher to do it) then place the pork, uncovered, in the refrigerator overnight to ensure the skin is dry and then be sure to rub salt well into the skin and the cuts between it. If all else fails, you can take the crackling off and crisp it up under a hot grill or even in the microwave. 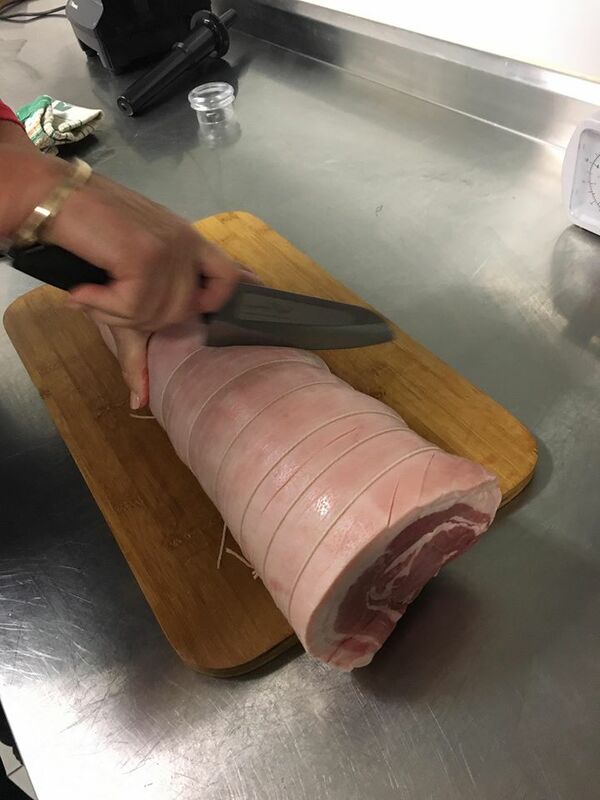 To prepare the pork, score the skin by making cuts 1 cm apart using a very sharp knife. Even if your butcher has done this for you, it is best to add extra scores. Place the pork in a colander or on a rack in the sink and pour over a kettle full of boiling water. 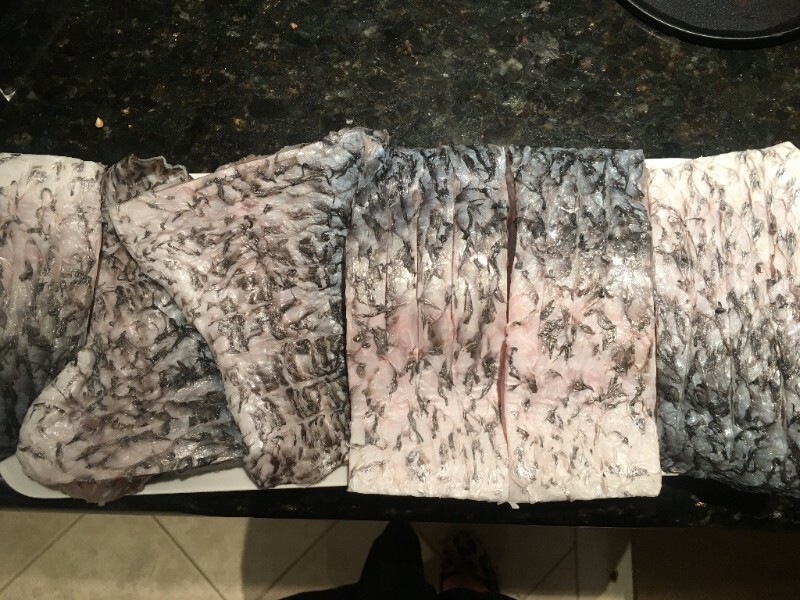 Dry the skin very well with paper towel then place in the refrigerator for a couple of hours or for best results overnight. 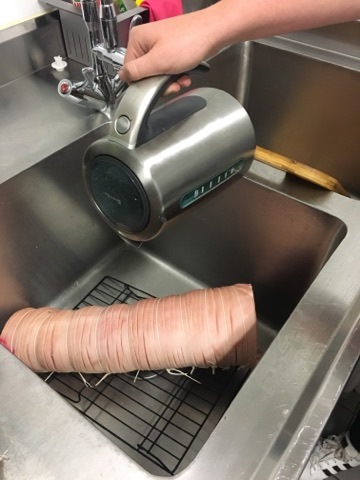 Remove the pork from the refrigerator and check that the rind is dry and, if desired, use a hairdryer on the cold setting to ensure it is. 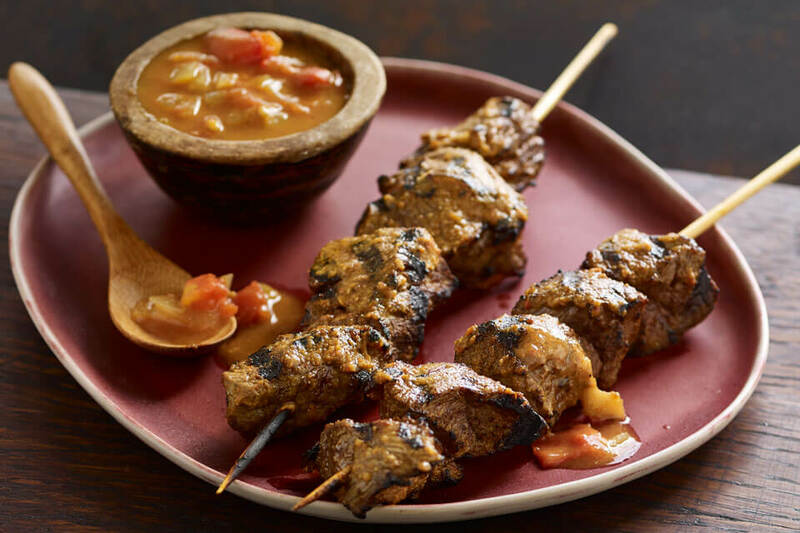 Rub generously with salt (ordinary salt or cooking salt is best), massaging it into the cuts in the skin. 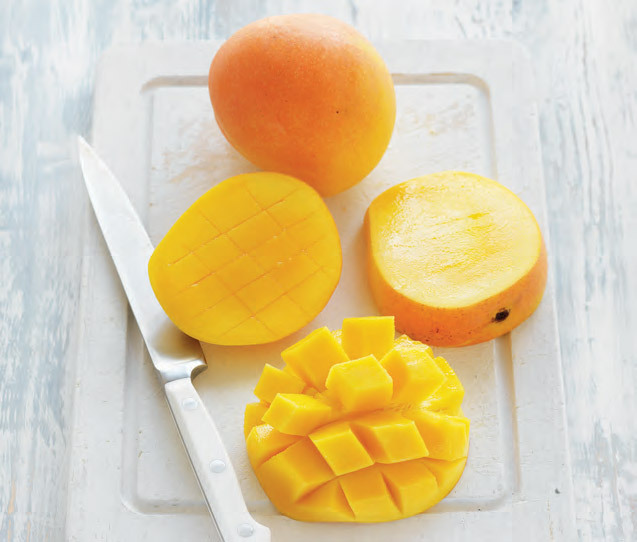 Leave at room temperature while the oven preheats to 230°C. 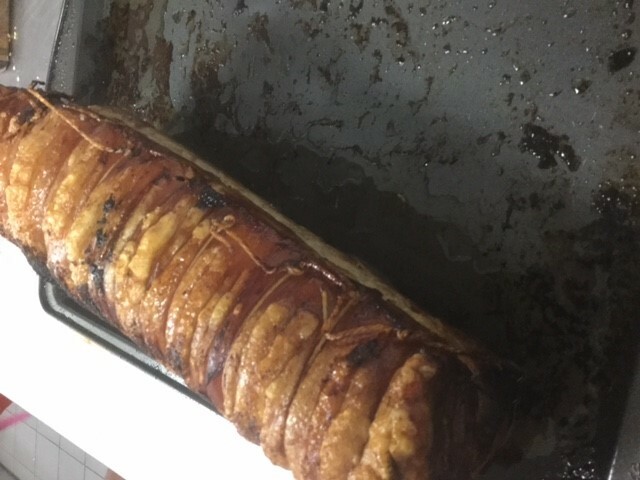 Place the pork on a rack in a heavy baking dish and roast for around 30 – 40 minutes or until the skin begins to crackle. Meanwhile, line a large baking tray with baking paper. Place potatoes and pumpkin on the baking tray, drizzle with oil and season with salt and pepper. 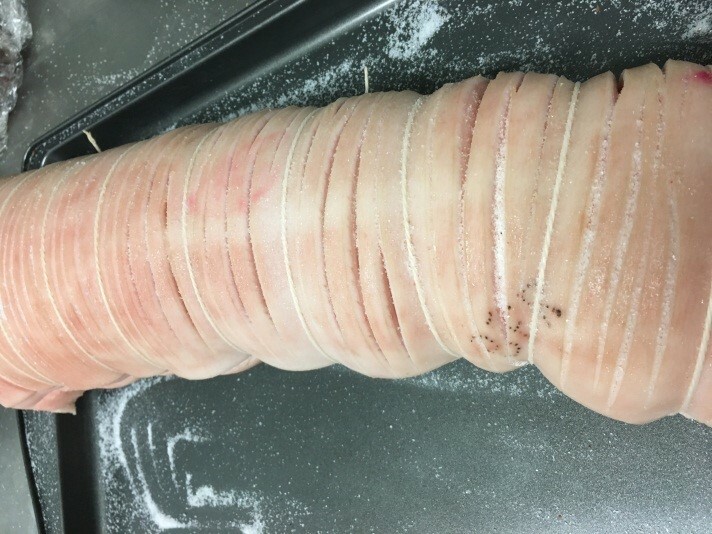 After 30 – 40 minutes, when the skin is crackling, if the skin also extends underneath the roll, turn the pork over. (Insert a meat thermometer if you have one.) Reduce the oven temperature to 190°C, place the vegetables in the oven and continue to cook for 60 minutes or more, turning the vegetables at least once. Turn the pork back over to the other side increase the heat to 230°C and cook for a further 15 minutes. 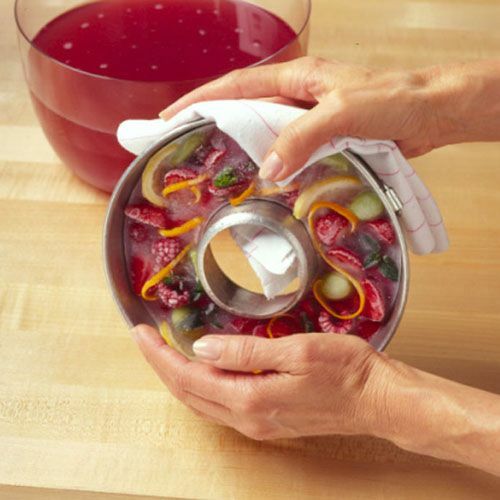 Test for doneness either with a meat thermometer (the internal temperature should be 63–70°C for medium and 72–75°C for well done), or until the juices run clear. Remove the pork to a warm plate, cover loosely with foil and rest for 20 minutes. Pour out any excess fat from the pork baking dish, place over high heat and add the apple cider or wine and chicken stock. Bring to the boil, scraping the bottom of the baking dish to dislodge the sediment. 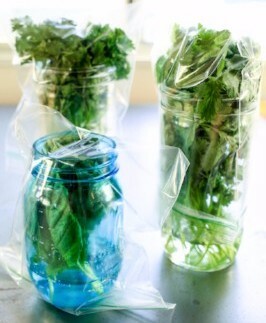 Reduce the liquid by about half. Season to taste with salt and pepper. 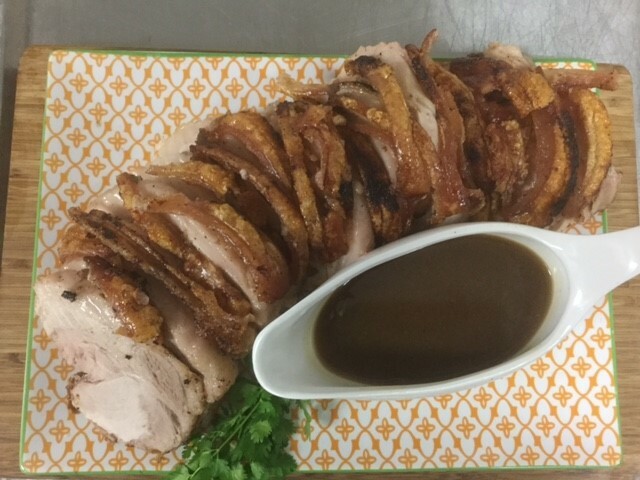 To serve, carve the pork into slices, drizzle with the cider jus and serve with the vegetables and broccolini, asparagus or green vegetable of choice. Relax, sit back and accept the compliments! Making this in New England this year, Lyndey. Thank you for a wonderful recipe and demonstration.